(The kite, not the plot- or is it both?). There’s to be a new world largest kite; first flight to be ?????????????????????? It will be a Ray of the new style (smooth tail), approximately 75m wingspan and 150m long (including tail), 1250square metres. Or rather this is the plan, but there’s a bit of a hitch. During July and August, Peter Lynn Kites Ltd built a 20m x 40m long (100sq.m) prototype to check and develop various shape and stability aspects, which I then brought, unflown, to Europe in late August so as to have something to do during spare moments at the events I’m currently attending here:- Lemwerder, St Peter Ording, Wangerooge, Borkum, Melle (rained out to the extent that kite surfers took over the main field, but that’s another story), Bristol, Dieppe, Scheveningen and the Buggy Worlds in Belgium. This prototype wasn’t a scaled up maxi but a scaled down model of what the mega version is to be- myriad thru cords and far too many panels for just 100sq.m. Unfortunately, I arrived in Hamburg, but it didn’t- lost somewhere along the way (Christchurch- Auckland-Los Angeles-Heathrow by Air NZ, then to Hamburg by Lufthansa)- and still not found (48 days now). Doubly unfortunately, I had courageously or stupidly (take your pick) suggested that this next mega would be able to fly single line without stabilising sidelines or a Pilot in at least some wind conditions. And I think it will be able to- but was relying on having 3 months to test and develop the prototype before construction needs to begin in November. Losing all our wiggle margin already is not ideal, but we’re absolutely determined not to let this delay the launch date. For airlines to lose bags is not unusual, happens to me a few times every year, and they always get found and catch up again within a few days, courteously dealt with on both sides. Considering the millions of bags floating around in airspace, it’s a tribute to their systems and efficiency that they don’t lose more. This is the first time in 34 years of kite travelling that I’ve lost a bag permanently- though about ten years ago I thought I had (and so did the airline involved) but after 3 months, quite by chance, I found it at Vlieger Op in Holland. It turned out that the airline had mistakenly forwarded it to there (where it sat unnoticed in the warehouse) rather than to me in NZ. This time, the lady at the lost bag counter in Hamburg Airport was initially helpful and apologetic ( but I bet she has trouble getting out of bed each morning with this to look forward to all day), though she declined my request for information as to where this bag had last been scanned. After the first day or two, still no kite, I asked Lufthansa for an email address to which I could send an actual photo of the bag, and another of its contents- so that they would at least know what to look for. ( I generally photograph my bags during check-in against this contingency as none of the luggage types on their standard photo sheet look even remotely like a kite crush bag). This was declined with “—-we don’t deal with passengers by email, please leave a phone number and we’ll contact you when there’s any news”. Apparently they don’t need to know what a bag or its contents look like in order to search for it. After 10 days goading, they did finally provide an email contact- to which I promptly sent photos of the bag, the kite and of a bar code baggage label that fell off another of my bags (by adhesive failure) when I returned (by Lufthansa) to London (fortunately it happened after the bag made it to the carousel). They thanked me for the photos, then declared the bag terminally (ha ha) lost and passed my file over to one Lizette Smit, a Lufthansa customer relations manager in of all places , Melbourne, Australia. Lizette then persistently requested my bank account details so that they could pay out and close the file. I don’t know that they just binned the photos. 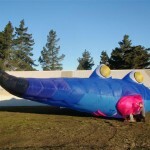 The amount offered was Euro1200, a small fraction of the kite’s value and consequential damages to PLK Ltd. This shortfall had been dismissed by a Lufthansa spokesperson during the earlier verbal phase with “that’s not our problem”. After many verbal requests and then increasingly terse emails, Lizette finally relented and sent me the tracing file on the 8th Sept, 26 days after the bag was lost. I wanted this tracing information so as to able to make direct inquiries at the most likely airports (probably the one after it was last scanned going onto a plane). I had in mind a rather famous incident in NZ political history when the then state owned NZ Railways lost a farmer’s tractor. After many months of fruitless searching, they gave up and offered to pay out a nominal amount. The farmer then decided to look for it himself, and found it parked on a siding in less than a day. When Lizette then ceased responding at all, I fell back on Air NZ (Star Alliance partner with Lufthansa). 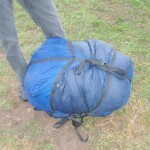 They probably lost the bag, but inter-airline protocols make lost baggage the responsibility of the final carrier. Air NZ really tried to find it, pulled out all the stops I think. 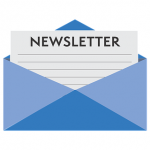 I’ve had emails personally from their CEO Rob Fyfe (even though my primary membership of Star Alliance is with Singapore airlines now, not with Air NZ)- but to no avail so far. Perhaps it’s now buried under the heaps of totally lost bags that I’m told accumulate at Heathrow (this is where the tracing information points to), eventually to be sold off for the standard Pounds 20 or so. What do I think of Lufthansa? Their failure to provide me with tracing information to enable a timely independent search and their initial refusal to accept photos of the bag and its contents (surely essential for any proper search, especially if the address tag and bar code label had fallen off) seem more like obstruction than service. Not the sort of treatment I expected as a Star Alliance elite gold frequent flier from a full service Star Alliance airline- not an acceptable way to treat any customer. Lufthansa’s customer policies now seem to me to be like the signs on trucks seeking feedback about their driving behaviour. 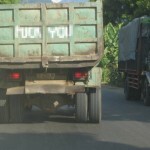 Perhaps some are sincere, but the only one that I really believe is from Bali (attached), at least it’s honest. But can the kite still be found, are there any ideas out there as to what I can try now? Just a thought; has anyone seen a 20m wingspan mainly blue (yellow eyes) Ray flying anywhere yet? Sooner or later we will I suspect. But I also suspect that I should just stop whinging and get on with a new prototype when I arrive back to NZ this weekend. PS. Also in the lost bag is the only existing next model Pilot kite, on which I’ve laboured long and hard. Nor do I have it’s critical dimensions- time was short so I left measuring it up for later- double damn! PS: …and here at the Factory we have a SPECIAL on Midi Fish NZ$900.00, be in quick we have 3 x Hot Colours and 3 x Cold Colours.